It’s certainly another year of Slimmer, Lighter, More Productive. MSI are all over that bandwagon, with the X-Slim 320, weighing in at 1.3kg and boasting a 13.4-inch screen, they’re hoping to lure people in with the promises of Champagne Gold, Pearl White and Stylish Black. In their own words, the X320 is also very “thin”. Yes, apparently the word thin now neccesitates some quotation marks – your guess is as good as mine. 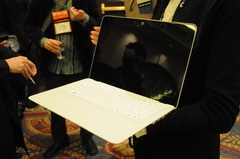 In terms of actual numbers, it measure 1.98 cm, and is only 6mm “thin” at it’s thinnest point. Battery life is up to 10 hours, which is hours worth of covering up the MSI logo and pretending you’ve actually splashed out on a Macbook Air.